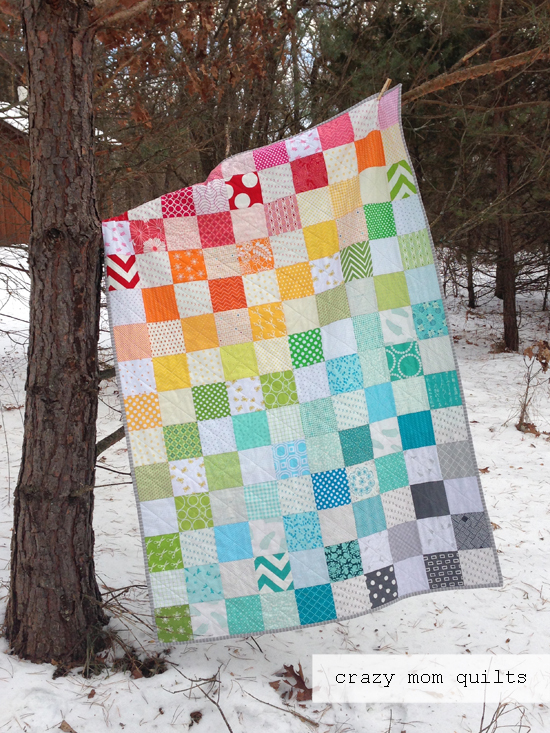 I was able to finish the rainbow scrap quilt this week! 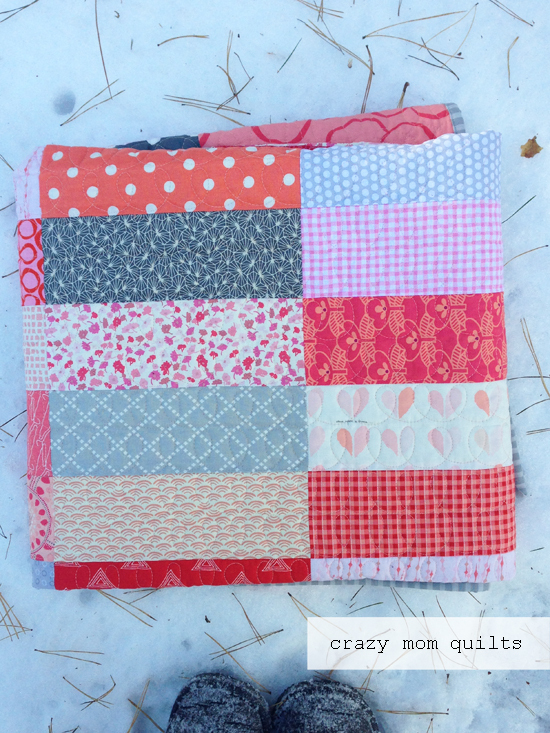 It is a simple quilt, through and through, but I love it all the same! If it were any larger, I'd be seriously tempted to keep it for myself. 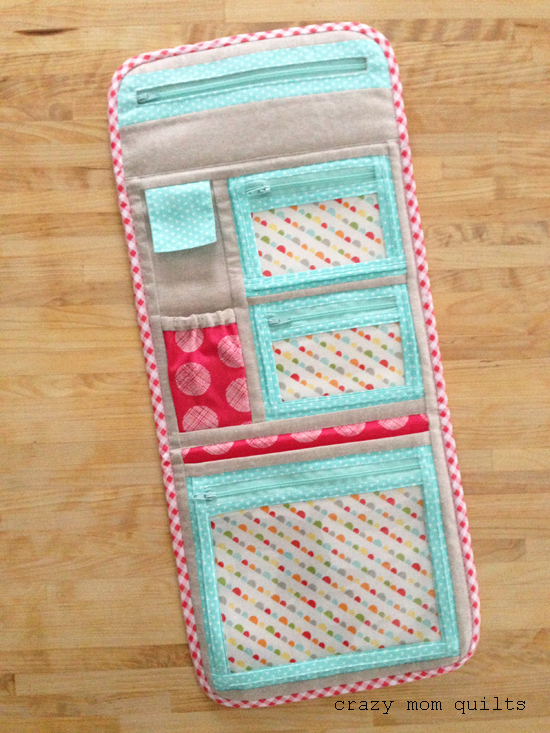 For the backing, I did some color-blocking with a few solid fabrics from the stash. Solids are nice to use for a pieced backing because it doesn't matter were the seam falls, there is no pattern repeat to match! 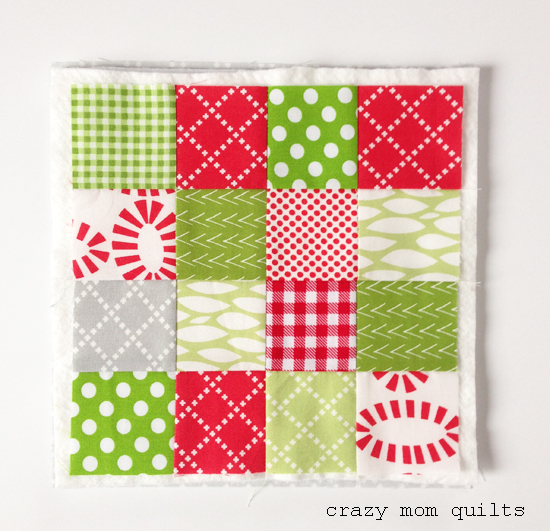 I kept the quilting super simple....just an X through each block. 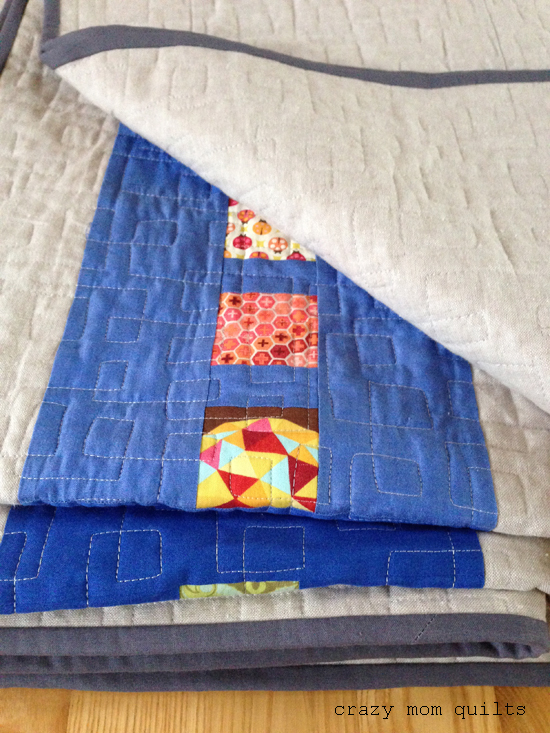 I used my hera marker to mark the lines before I quilted, because I'm horrible at just eye-balling it. It's an extra step, but to me, it's totally worth it. 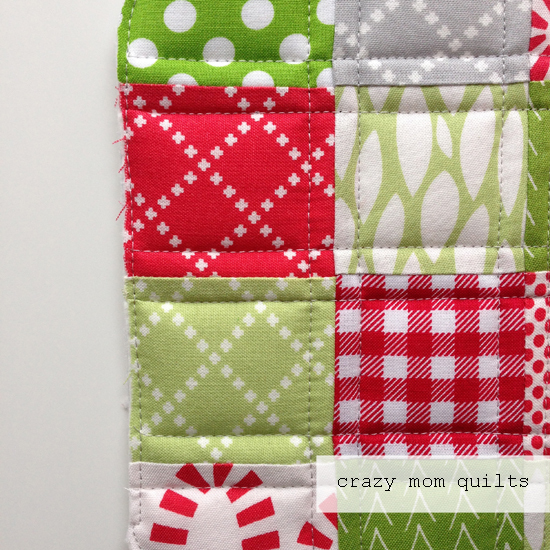 There is such a fun variety of fabrics in this quilt! I had to dig deep for enough low volume prints to fill in. Some were repeated several times, but I think it worked well anyway. 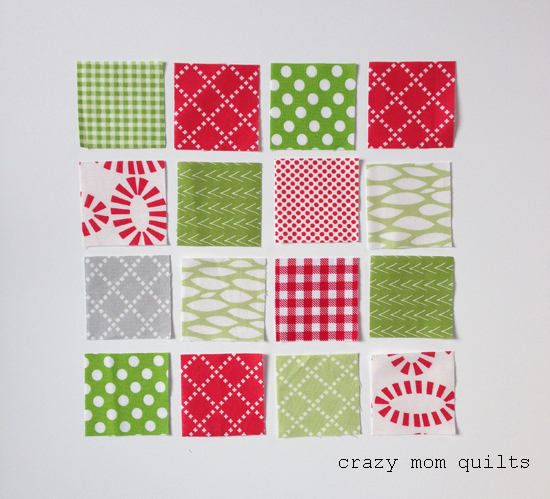 The patchwork squares were cut at 5". 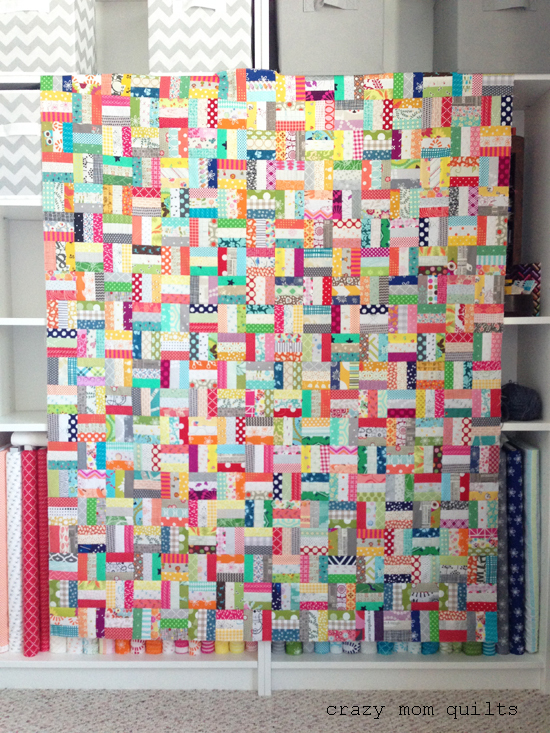 The quilt measures 45" x 63" and it's scrap project # 190! 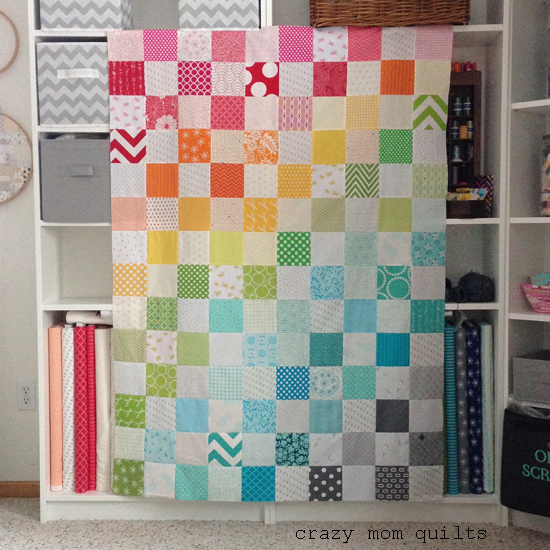 My crazy rails quilt top is complete! Each of those little logs (all 960 of them!) finish at 1" x 3". 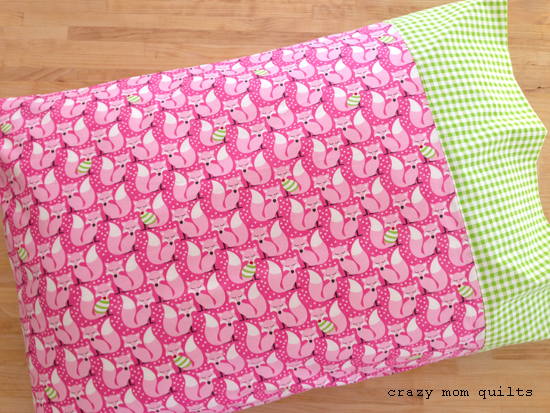 I love how it turned out and definitely plan to revisit this pattern again....either in a twin or king size next time. 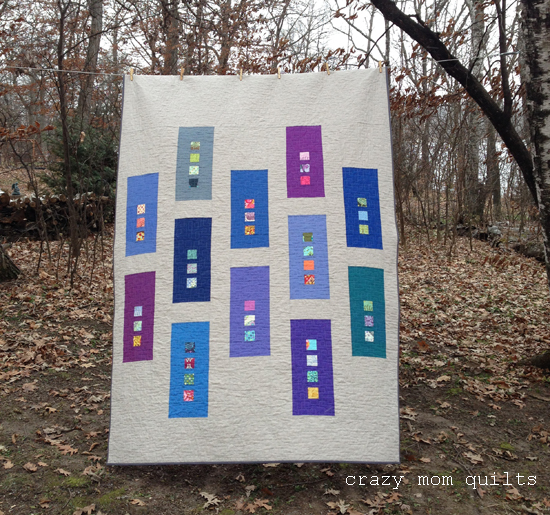 This quilt top measures 48" x 60". 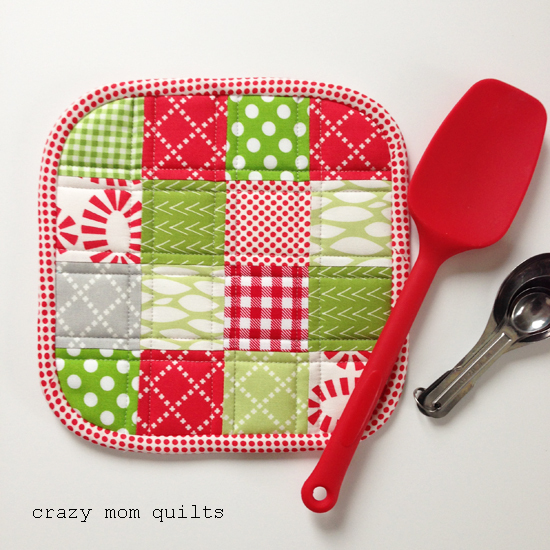 This is a great scrap buster, because almost anything goes! Gotta love that! 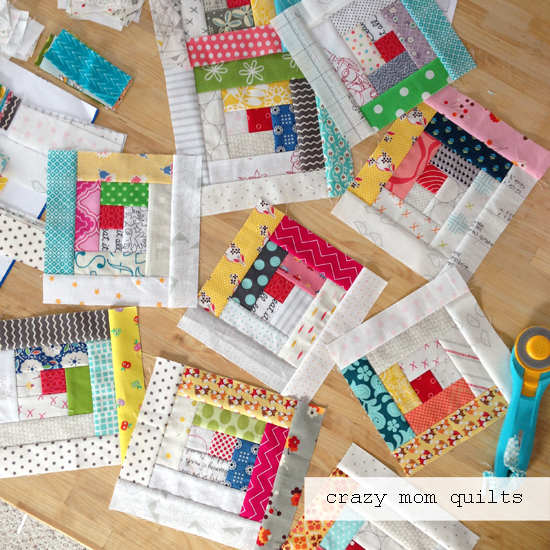 There are a few more days left this year, so naturally I'm doing a final push to see how many quilts I can finish before the calendar changes to 2017! 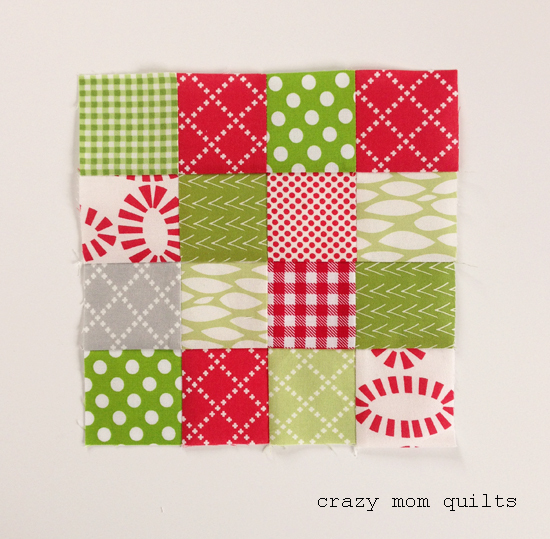 This is a simple scrap quilt made of 5" squares. I loved playing with the layout of this one. 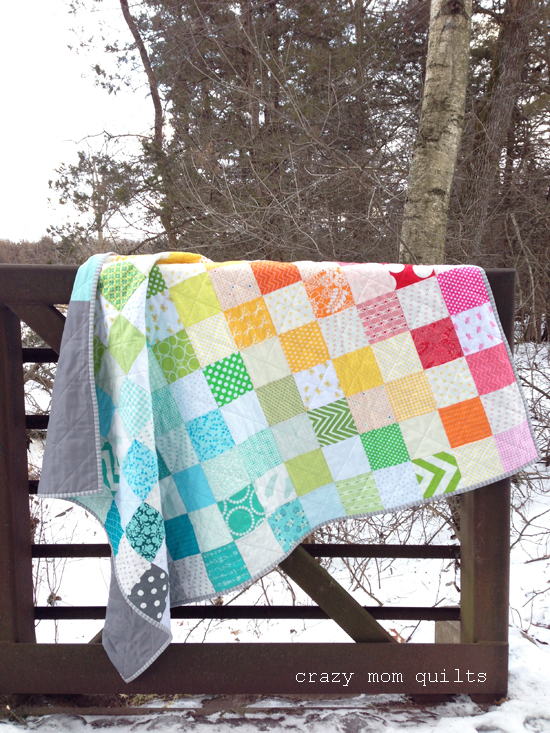 The mix of brights and low volume fabrics makes it a very cheerful quilt! It probably comes as no surprise that the aqua almost took over. (hahaha!) 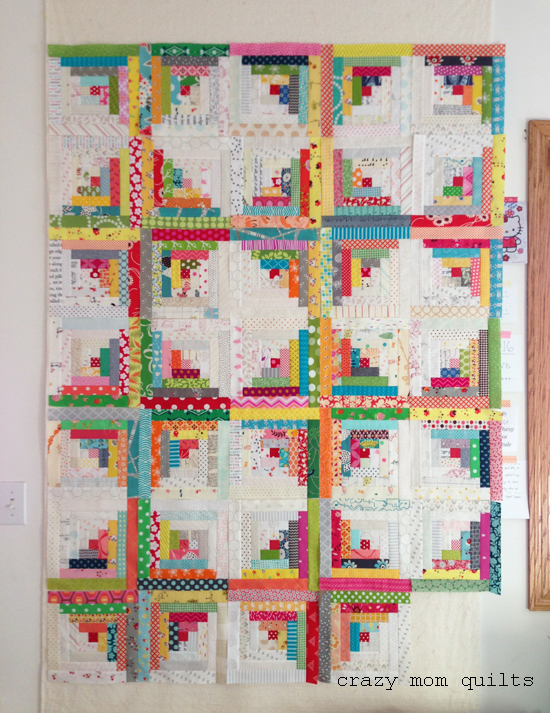 I'm hoping to finish this one (and maybe one or two more quilts) before Sunday. We'll see! 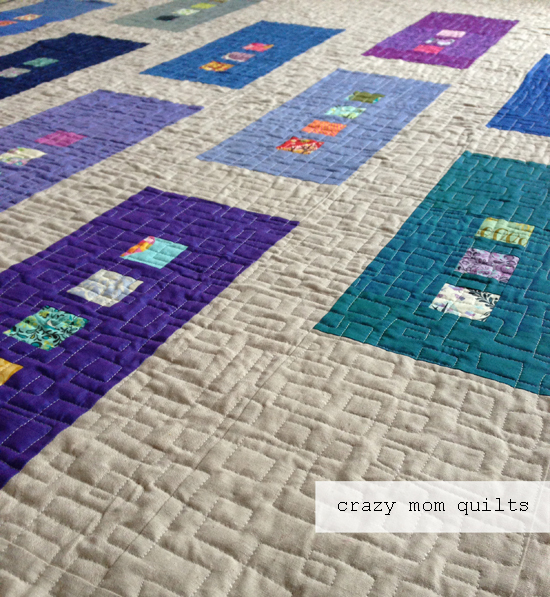 There will be plenty of quilting breaks to play board games with my family. I kind of love this week between Christmas and the New Year. I hope you are having a warm, cozy and restful week, too! 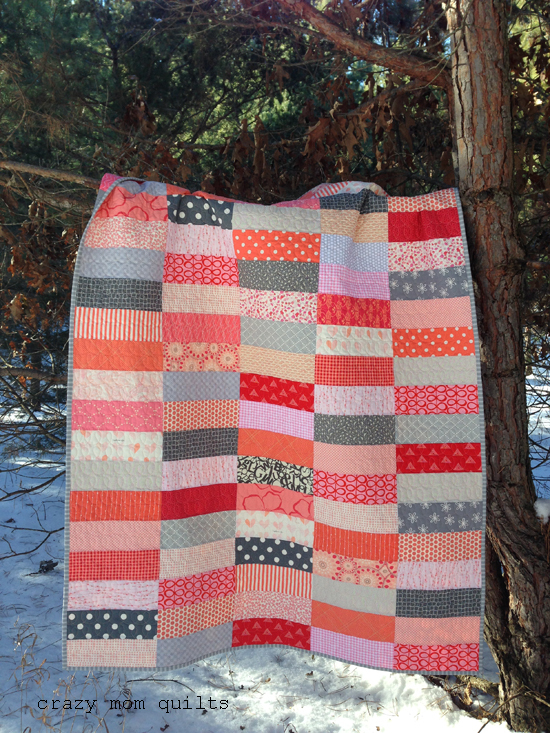 Despite all the craziness of the week before Christmas, I managed to finish a quilt! I'm pretty excited about that! 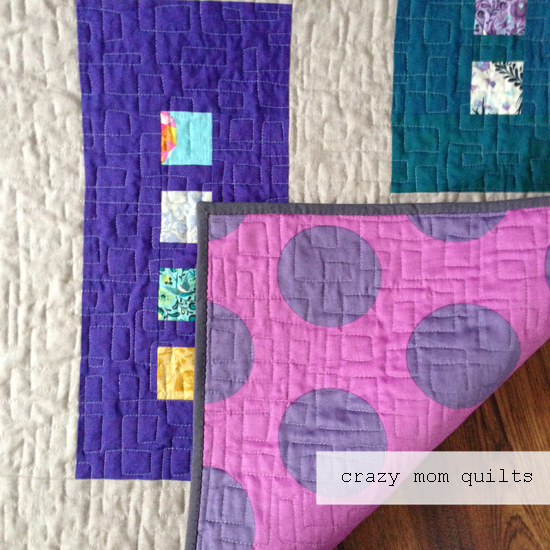 I'm calling this the straightforward quilt. 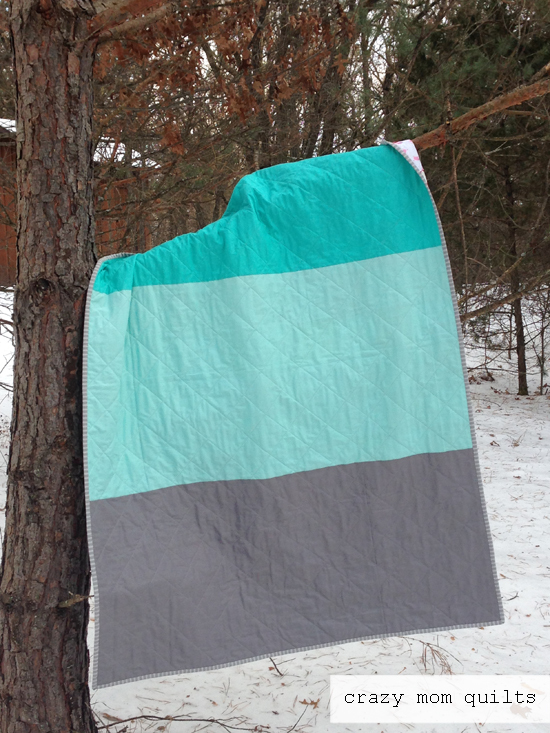 It is just a simple stash quilt, but I so enjoyed making it. 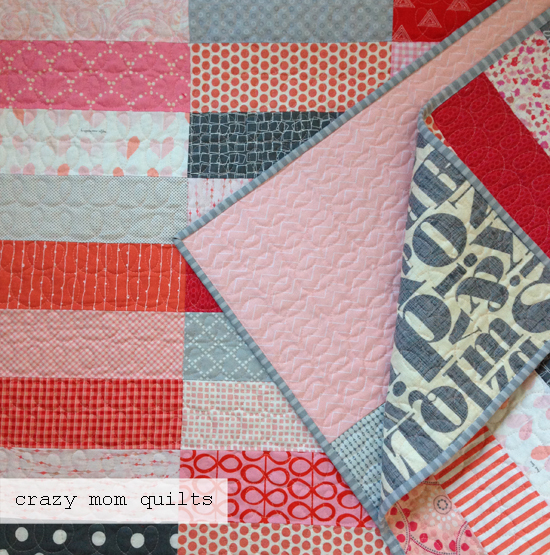 I love the larger pieces and the mix of pinks, corals and grays. 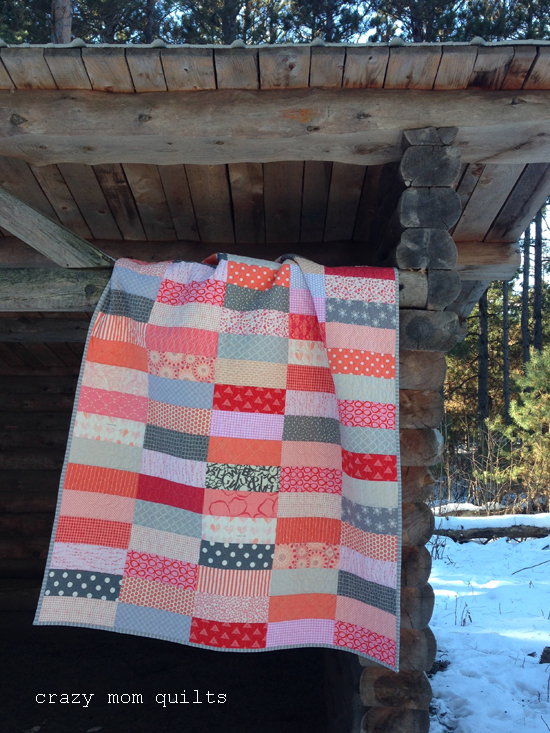 I free-motion quilted each row of patchwork with two lines of loops in peach thread. 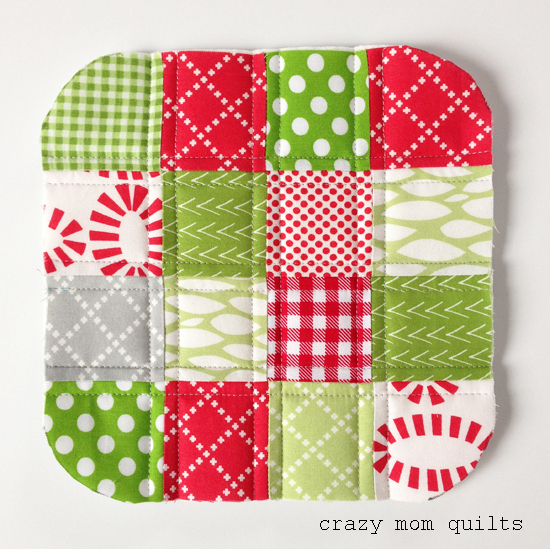 I love coming up with a backing from the stash because it's one big puzzle with many possible solutions. It took a bit of auditioning before I settled on this layout, but I'm quite pleased with the results! I love the simplicity and the fact that it is asymmetrical. ....and the scenery was just gorgeous! I've been knitting away on my sweater! 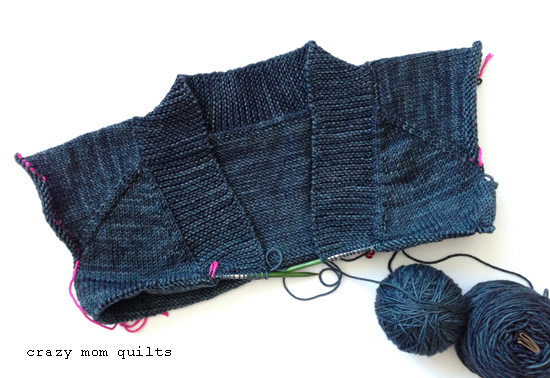 Late last week, I realized I had knit a row incorrectly, so I had to knit back about 10 rows! That was super frustrating. 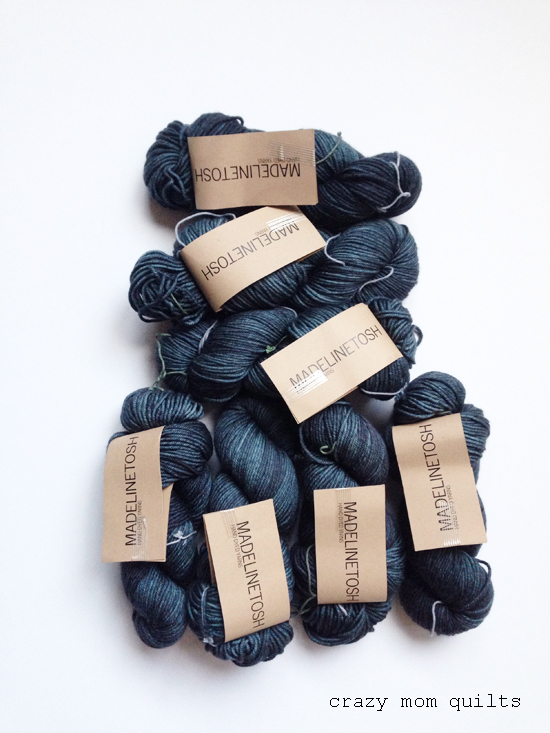 I also learned (thanks to my friend Suzanne) why it is important to alternate skeins of yarn when working with hand dyed yarn. I will admit that I got kind of freaked out and I was frustrated that there is so much to knitting that I have absolutely no clue about. However, I am enjoying learning new things...even if it is a little painful. 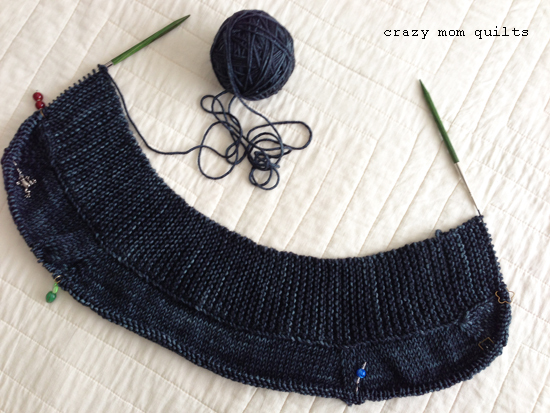 :) I'm knitting forward again, and I am pleased with my progress! I very carefully tried on the sweater this morning and the size is spot on. What a relief! I really love the color and how the yarn is knitting up. To counter balance the huge knitting project, I am also working on quick finishes. 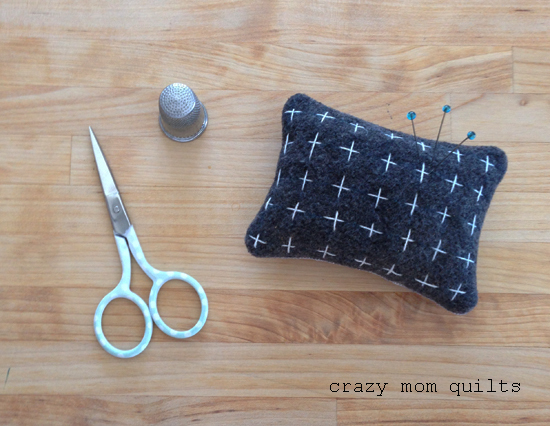 This little cross pincushion was inspired by this pillow that Anna made awhile back. I loved it so. 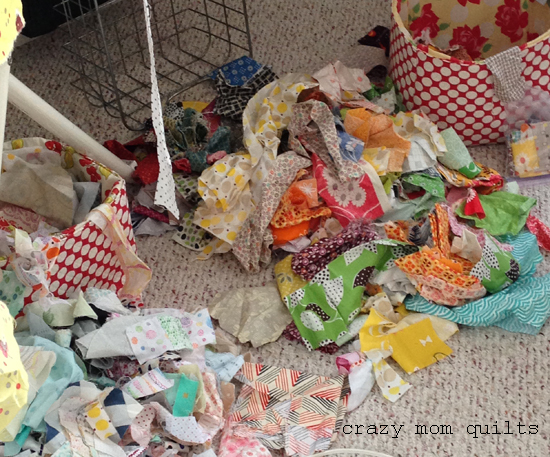 In fact, this fabric scrap came from Anna and I believe that it was actually leftover from her pillow. I absolutely love it in pincushion form! It measures 3 1/2" x 2 1/2". 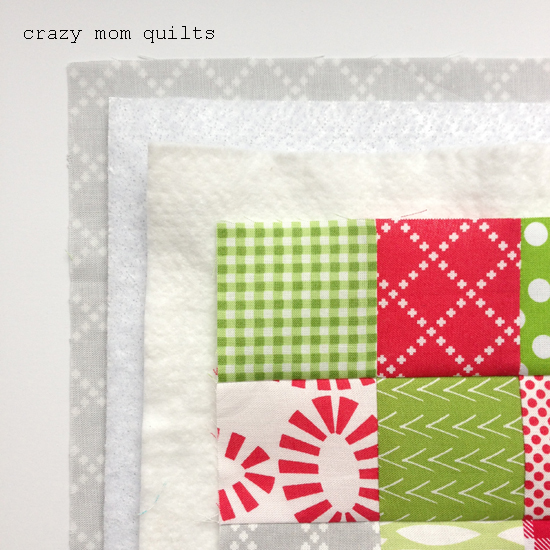 It is scrap project #189! I also whipped up a few pillow cases. 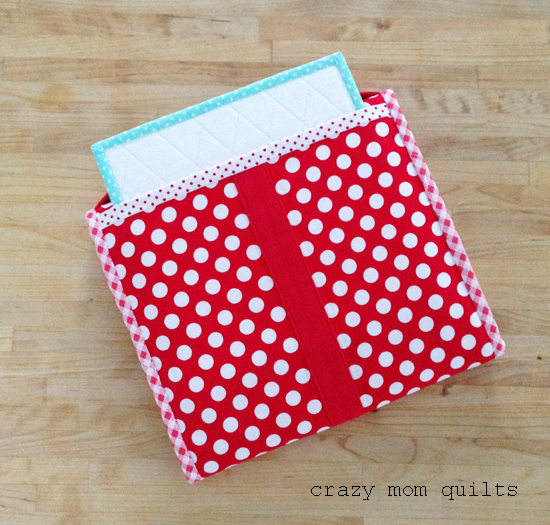 I love making these because they are good stash busters AND a great way to use cute novelty prints. This festive fox one is for me! I found the fabric at SR Harris about a week an a half ago and it was too cute to pass up. 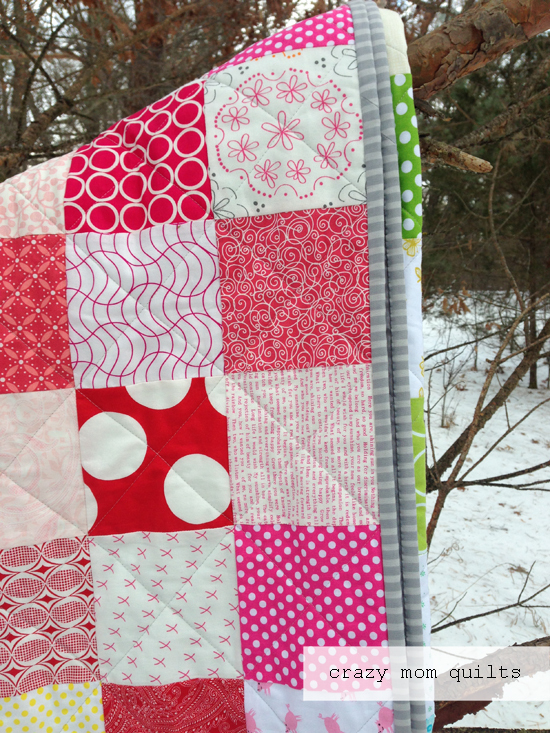 The main fabric is festive forest by TamaraKate for Michael Miller Fabrics. 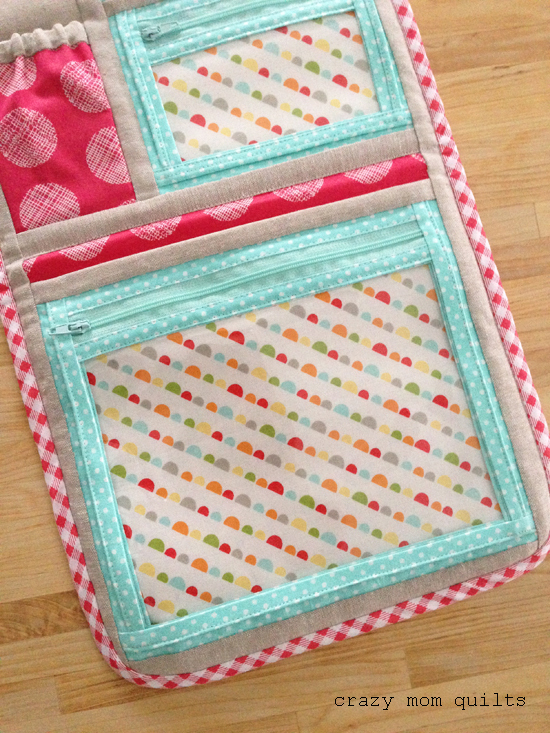 The cuff fabric is Picnic Pals by Alyssa Thomas of Penguin & Fish for Clothworks. Since I won't want to share my new pillow case (how terrible is that?) I made this one for my cartwheel-loving daughter. 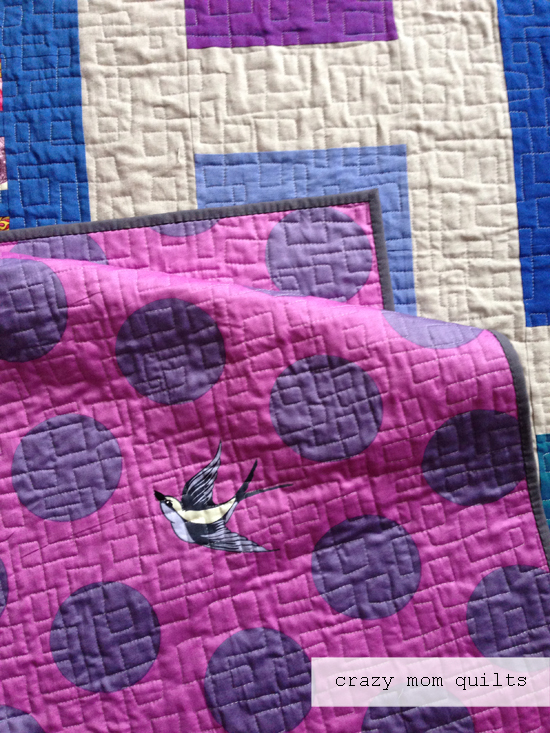 The main fabric is Hello Petal by Aneela Hoey for Moda. 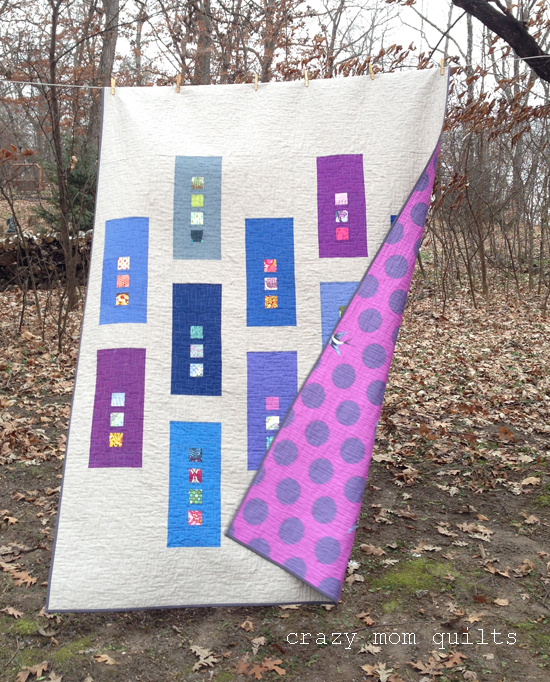 The cuff fabric is Kiss Dot by Michael Miller. I have a feeling that she is going to love it! 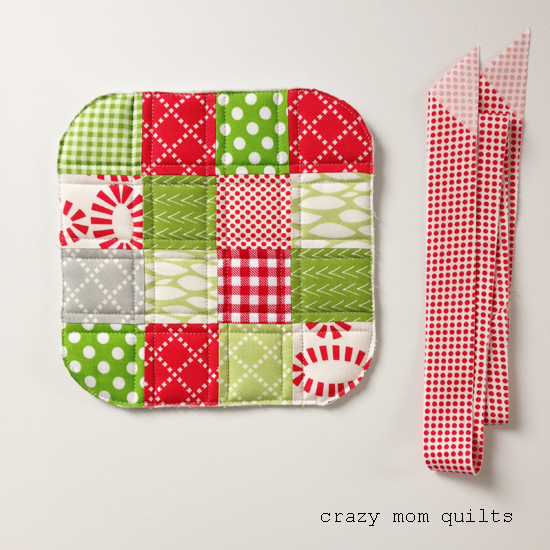 I'm so thankful for quick projects that I can sew from the stash. Perfect for the week before Christmas! I've been working on this project for the past few weeks, but due to the need for a finish today, I worked extra hard to get it done. I'm so glad that I did! 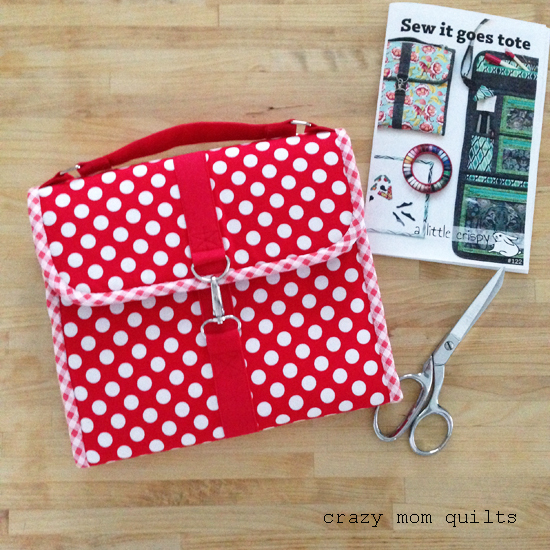 This is called the Sew It Goes Tote, and it's a pattern designed by my very talented friend Kristin. Isn't it sooo cute??? The tote was designed for traveling with a hand work project. 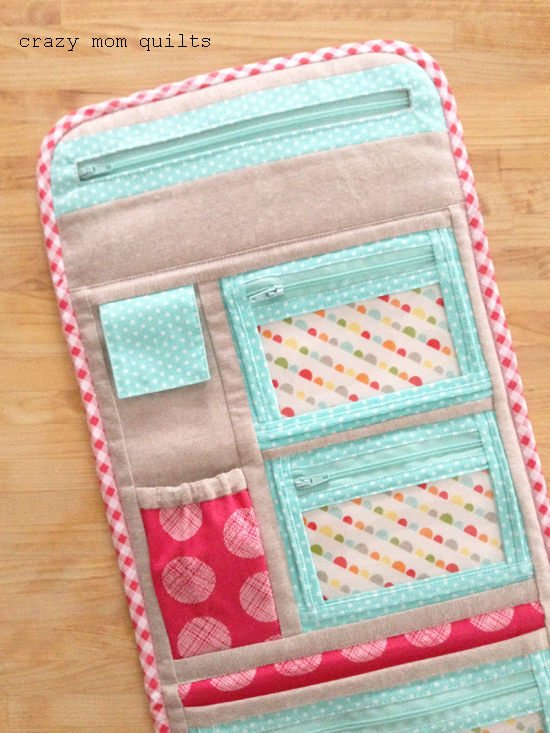 I love that it has a ton of compartments for all the little things that you need when you are hand stitching. I was a little intimidated by this project (4 zipper compartments alone...plus vinyl), but I took it step by step and worked slowly. It came together very well! It really wasn't that hard...just a little time consuming. :) My friend Mary also made the project and she recommended cutting out all the pieces first. 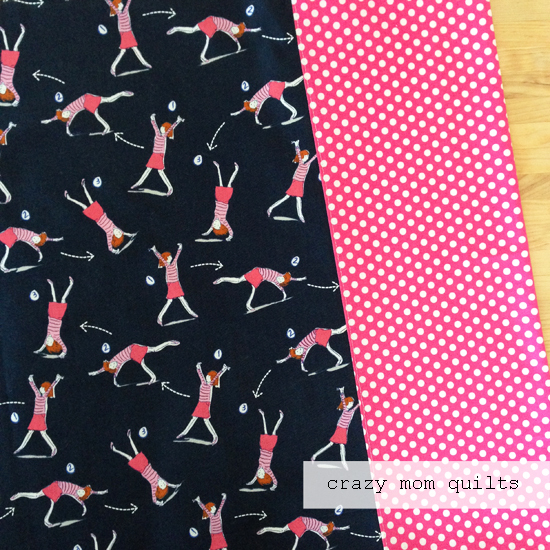 That goes against all my inclinations (what if I change my mind on a fabric?) but that was great advice. Turns out I'm very happy with my fabric choices! There are great diagrams in the pattern that show where each piece belongs, so that made selecting the fabrics much easier. When I wasn't sure what fabric to use, I chose Essex Linen in Flax. I love linen paired with all of the printed fabrics. I chose the aqua accents, because those were the zippers I had on hand. Plus, aqua and red is a combination that is hard to beat! ...that fits in the back pocket. So fun! I love, love, LOVE how it turned out! I also don't mind one bit that my version looks like a present! The tote measures about 10" x 10". The pattern is available for purchase here. I think I need to start a new hand work project....soon! A few days and hundreds of seams later, I have a total of 34 blocks complete. 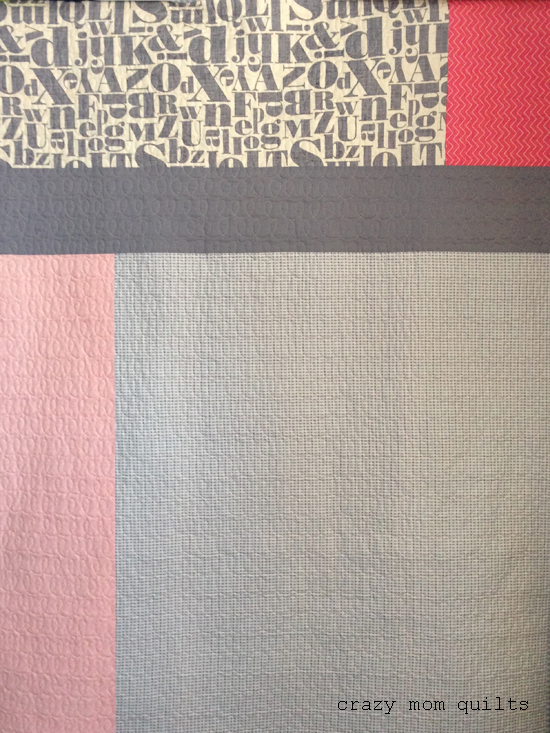 I only need 132 blocks for a king size quilt, so I'm about 25% done. That's encouraging, at least! 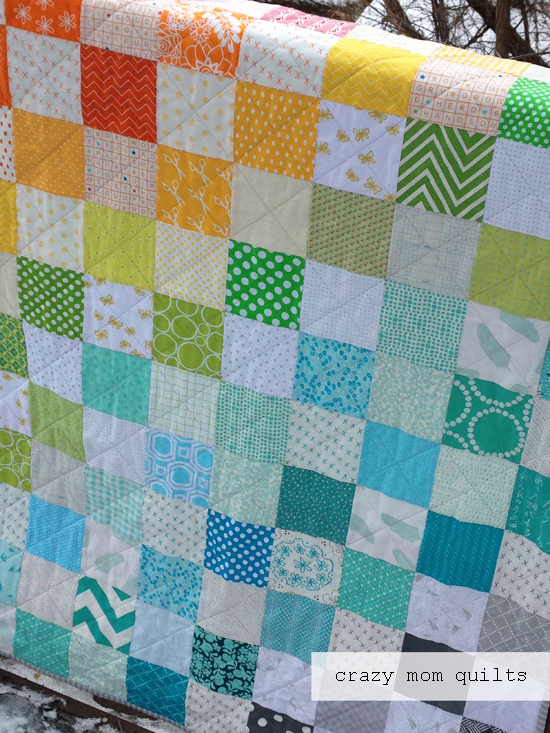 This quilt is definitely a labor of love, but it's going to look so good on my bed. 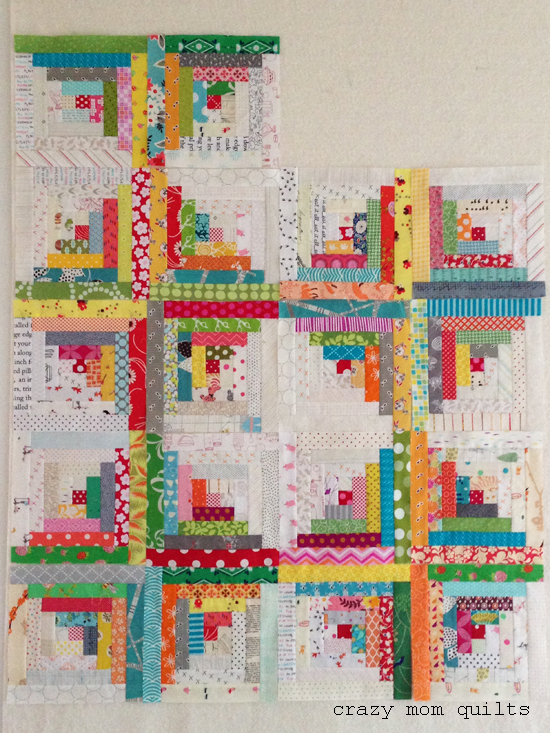 Each block is 9 1/2" unfinished. The complete measurements for the blocks can be found here. I've had a few requests for a hot pad tutorial...AND it's been on my mental list of things to do, so here we go! 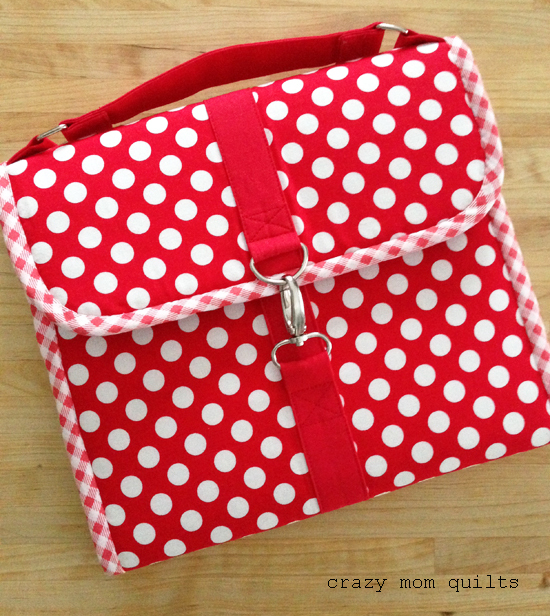 This is an easy afternoon sewing project...in theory, anyway. 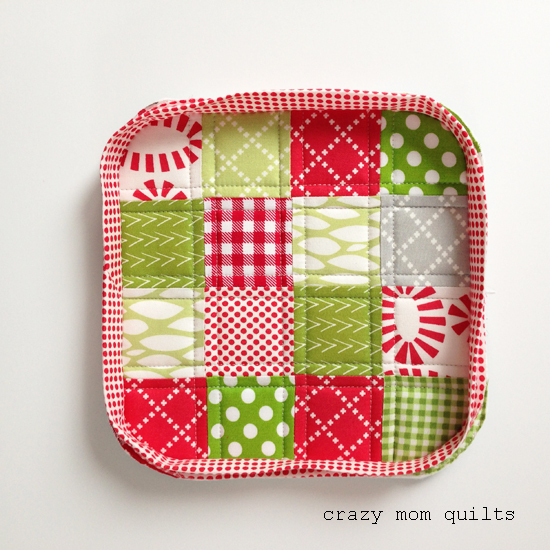 :) It's a great way to use up some scraps or mini charm packs. These were gifts for a friend that I made last year. 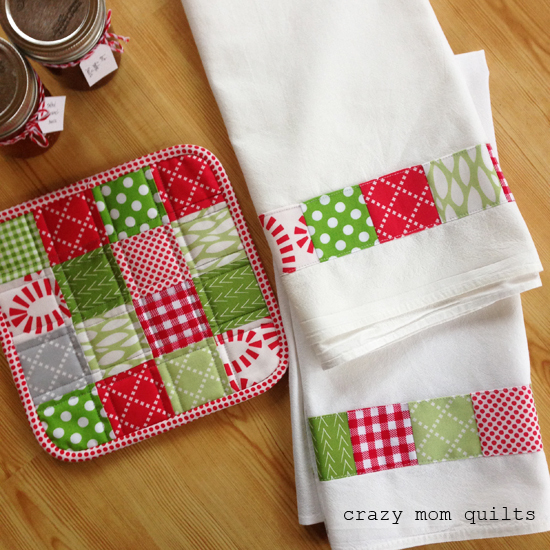 The patchwork dishtowel tutorial can be found here. The recipes for the sauces can be found in this post. Step 1: Select 16 2 1/2" squares and arrange in a 4 by 4 array. 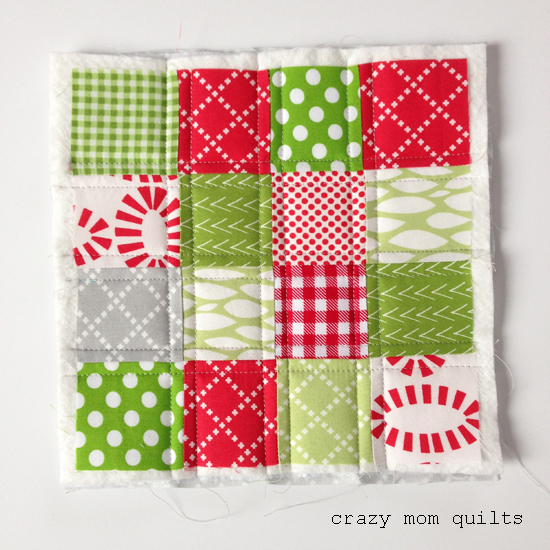 Step 2: Sew the squares into rows. 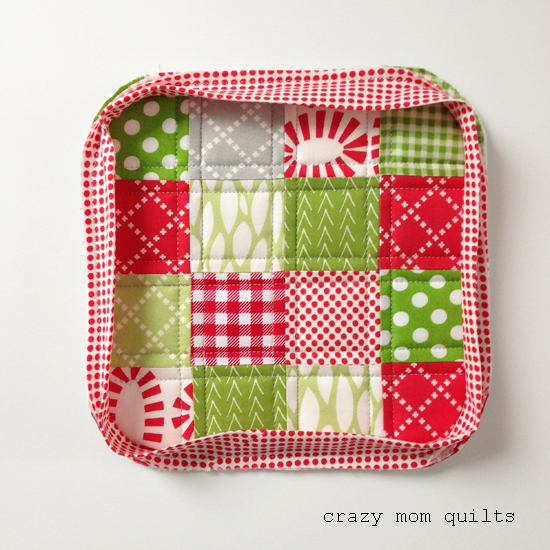 Sew the rows together and press well. The block should measure 8 1/2" square. 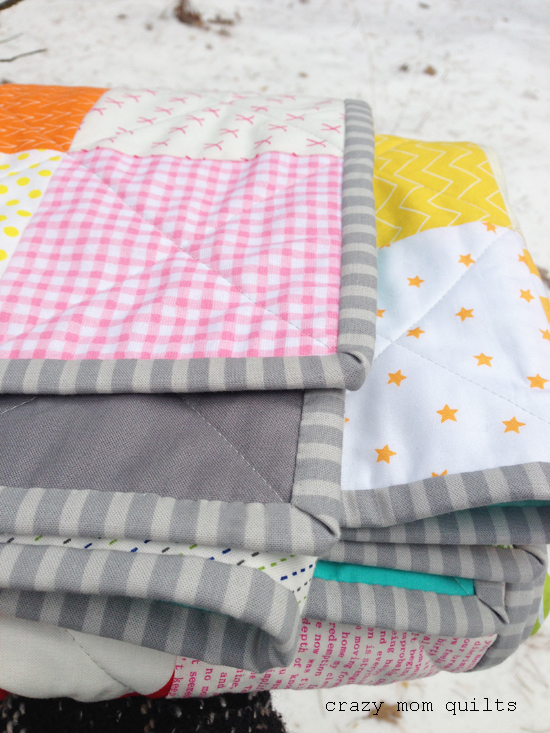 Step 3: Make a quilt sandwich. 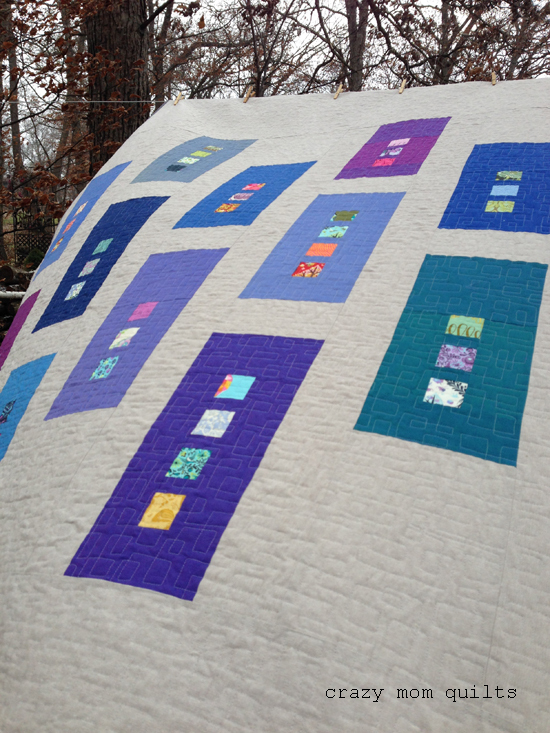 Layer the backing (face down), Insul-Brite, cotton batting, then the patchwork (right side up). Align the layers. Pin baste if desired. Step 4: Attach a walking foot to your sewing machine. Quilt the piece with straight lines, echoing the seam lines on both sides. There will be shifting! 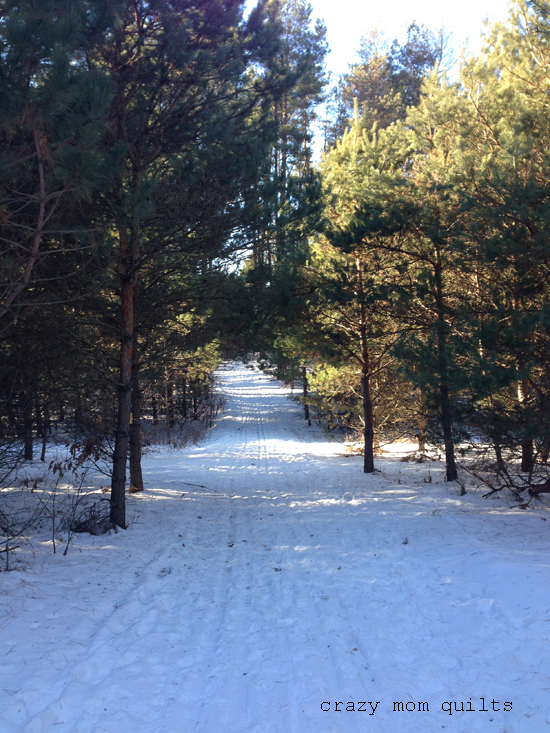 There are a lot of bulky layers, so take it slow and try to let the walking foot do the work. It will probably get a little bit wonky. Step 5: Use the base of a mug, a cup or a circular object of some sort. Use a marker or marking pen to trace the arc in all 4 corners. Step 6: Trim off the excess batting, backing, etc. Trim around the marked corners as well. 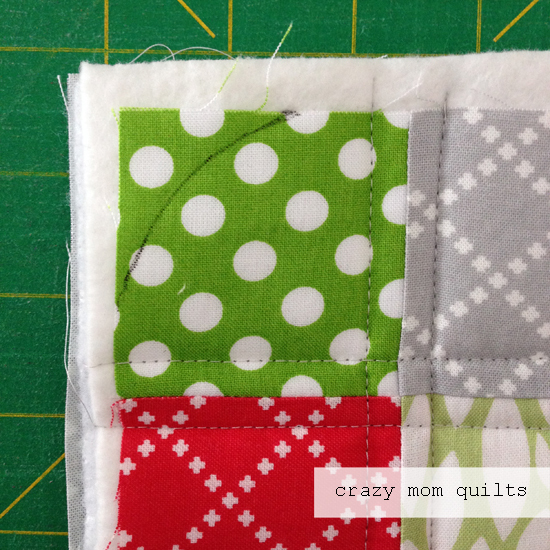 Step 7: Sew a line of stitching around the perimeter of the piece to hold all the layers together. This makes it so much easier to apply the binding. 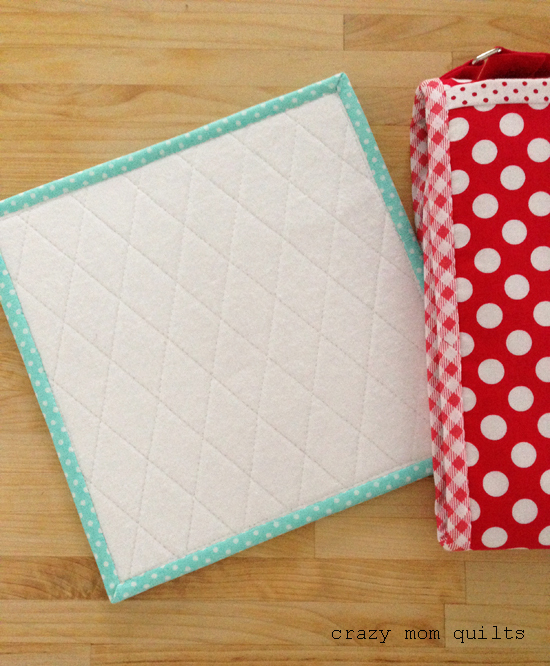 Step 12: Use your new hot pad or give it to a friend! Repeat as needed! 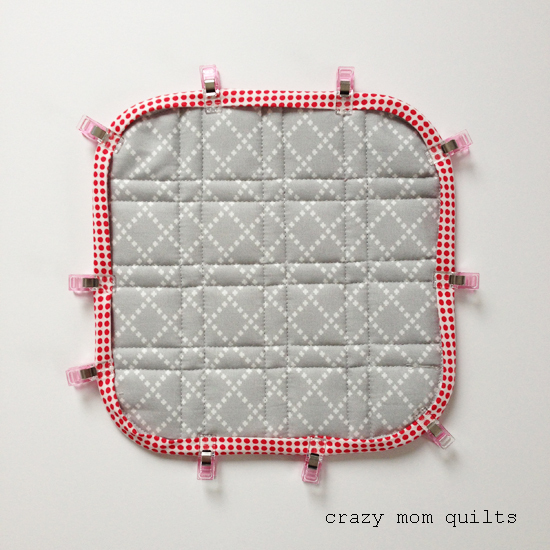 If you make any hot pads using this tutorial, I'd love to see them! This is what I've got so far! I'll be sure to let you know how the rest of it goes. Here's to learning something new! If all else fails, my entire family can have matching hats and hand warmers. Everyone, especially my teenage boys, are hopeful the sweater is successful. Ha!